Each office can have their own internal wiki, similar to wikipedia. In the Main Menu, click Tools, Wiki. The home page will open. Multiple wiki pages can be open at once. A wiki can be useful for posting employee policies, sharing troubleshooting information, keeping lists, etc. Blue text indicates a link to another page, folder, file or URL. 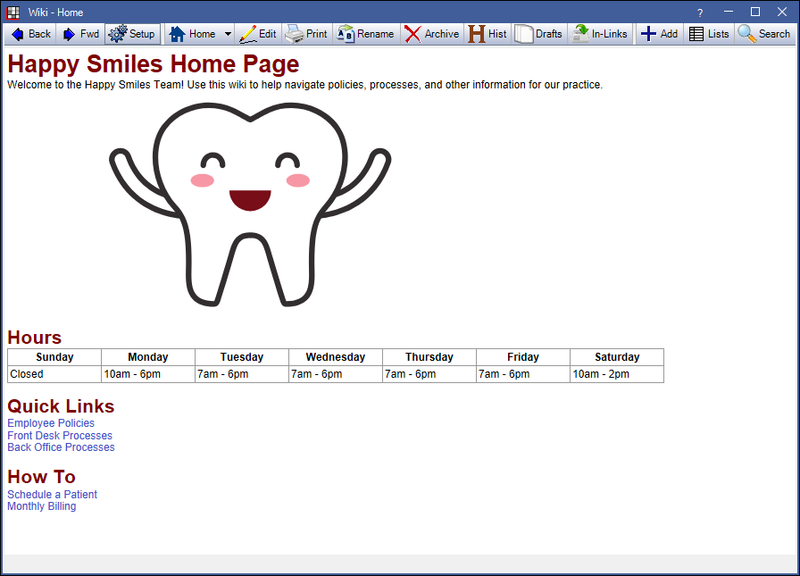 Wiki pages are displayed in html in a browser control inside of Open Dental. Pages are not stored internally as html; they are only processed from Wiki Markup to html as they are displayed. Users only edit the wiki markup, and have no direct control over the actual html results. This results in consistent pages and fast editing. An instant preview lets users see changes as they are made. Data is stored in the Open Dental database. Images are stored in the A to Z Folder in the wiki subfolder. Back: Move back one wiki page. Fwd: Move forward one wiki page. Setup: Customize the html master page and embedded stylesheet. Enable wiki link preferences. Detect wiki links in textboxes and grids: If checked, wiki links can be right clicked and opened from textboxes and grids, e.g. from Tasks. To create a wiki link in a task, use double brackets around the page title: [[Example Wiki Link]]. Allow new wiki pages from links: If checked, wiki pages that do not exist can be created when following a link from textboxes and grids. If unchecked, when a link for a wiki page that does not exist is right clicked, a warning will pop up that the page does not exist. Home: Jump to the wiki home page. Click the dropdown to save the current page as the home page. Edit: Edit the current wiki page. Print: Print the current wiki page. Rename: Rename the current wiki page. Page names determine the text that displays in the search. When you rename a page, all links to that page are automatically updated. Archive: Archive the current wiki page, removing it from the Search. Archived files can still be accessed (and restored) via the Search by checking Archived Only. History: View a complete dated archive of all previous versions of the current page. You can revert to a previous version by highlighting the version in the Page History window and clicking the Revert button on the right side of the screen. Drafts: View a list of saved drafts for the current page. Incoming Links: View all pages that are linked to the current page. Add: Create a new page. Lists: View, create and edit Wiki Lists. Search: Search the wiki for specific text. Pages that have matching keywords, listed alphabetically. Pages that have matching characters in the Page Name, listed alphabetically. Pages that have matching characters anywhere in the content, listed alphabetically. To exclude content from the results, click the Ignore Content checkbox. To only view previously archived pages, click Archived Only. Click Search, then select the corrupt page. On the error, click Continue. Click Edit and manually fix the page, or click History and revert to a previous version of the page.